Up until it’s latest software update, Spotify displayed a total fan follow count for each artist at the top right (of the desktop Spotify application interface). Now, that follow count is still displayed on the artist page, but it’s just much farther down on the page, near the left. It’s a ‘display’ paradigm shift, especially from an artist’s perspective. In ‘followers’ place, at the top right of an artist page, is now ‘Monthly Listeners’. The details of this can be seen, within the Spotify application, by clicking on the total monthly listener number at top right of an artist page. 1. info breaking down 5 (top, I suppose) areas and how many listens that month from each area. 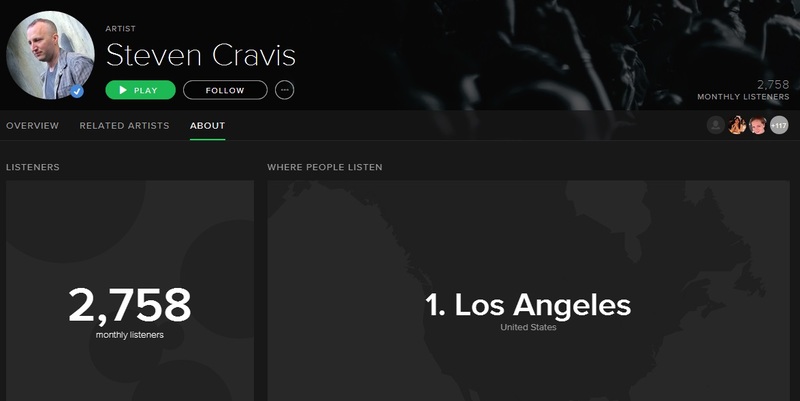 2. below the location info, ‘Discovered On’ followed by a list and link to playlists that include the artist, perhaps where new listeners discovered the artist. This is a big paradigm change on Spotify, perhaps not for listeners, but for the artists interested in seeing how things are going on a day to day or monthly basis, easily, just by looking at their own artist page. Leave your comments about why you think Spotify made this change, or any other comments you may have. No idea why….To quote Star Trek…..”You know engineers,….they just love to change things”.